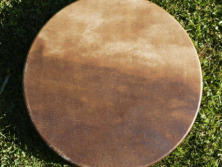 Sunreed's Traditional Native American frame drums are handmade by a North West Native American drum maker. He handcrafts beautiful, well tied, full wrap, frame drums which will withstand the rigors of long and rigorous use! Each drum is made in the traditional way in ceremony and with prayer. For most adults, we recommend the 18" size drums, for a full, rich tone, easy to hold. These are excellent for drum circles, or personal use in ceremony, ritual, or music. For those working in a traditional way, the 'medicine quality' of the animal you are working with, may be the most important ingredient in making your choice. For those in the Great Plains, Buffalo was the Great Gift of Spirit.